Sample social network, made using Palladio. The Goncourt Journals. March 1855-December 1859. A shared lesson in the medium and process of etching. All created in the same evening. Edgar Degas, Portrait of Alphonse Hirsch, 1875, Etching. Giuseppe De Nittis, Portrait of Alphonse Hirsch, 1875, Etching. Marcellin Desboutin, Portrait of Degas, 1875, Etching. Giuseppe De Nittis, Portrait of Degas, 1875, Etching. Michel Manzi. 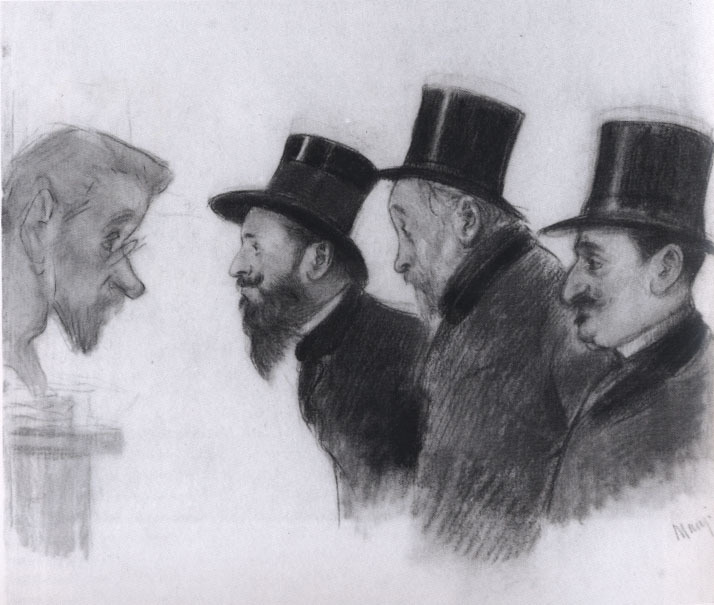 Albert Bartholomé, Edgar Degas and Michel Manzi in front of a bust of Paul Lafond, nd, Charcoal and pastel on paper. Mapping Paris: Social and Artistic Networks 1855-1889 analyzes nineteenth-century social networks in order to chart the artistic collaborations taking place in Paris between the Universal Expositions of 1855 and 1889. The networks are plotted through primary source documents, including letters, memoirs, journals and exhibition records, allowing an examination of individuals and the social links between them. It provides a mechanism by which historical social networks can be mapped and interrogated, and will be able to be easily be adapted by others in the humanities to investigate other social systems. It considers ways in which digital projects can engage with analog (non-digital) data. Much of the project’s data is not digitized and exists in analog, in the form of non-digital published and non-published text. Mechanisms by which to source, organize and record this data has been a focal point in much of the groundwork on the project, as well as considerations of the parameters, layout and theoretical underpinnings of the database. These primary source records of social experiences provide links between individuals, which when aggregated, slowly create a network map of the social interactions of artists in Paris between the years 1855-1889. A recent collaboration with Dr. Forrest Stonedahl's computer science course (Augustana College, CSC 285) focused on student groups creating a program that could standardize, capture and organize manual data input. The resultant projects are currently being evaluated to choose a program to utilize in the project. Leonardo, v. 49, no. 5 (October 2016), p. 446. Available online.